ATLANTA – Four Atlanta social ventures have been awarded a total of $200,000 by the Sara Blakely Foundation and Atlanta Emerging Markets, Inc. (AEMI) through the Civic Impact Loan Fund, an effort created in partnership with the Center for Civic Innovation (CCI) to support early-stage civic entrepreneurs in scaling their businesses and expanding their community impact in Atlanta. Each organization contributed $100,000 to fund early-stage civic entrepreneurs. In July 2018, four applicants were selected to receive the $200,000 in total funding: ChopArt, Dashboard US, The Dharma Project, and re:imagine/ATL. All four of the women leading these organizations are recent graduates of CCI’s Civic Innovation Residency program, a one-year intensive leadership, business development and coaching program for civic entrepreneurs in the greater Atlanta-area that was sponsored by the Spanx by Sara Blakely Foundation. CCI also provided deal sourcing, underwriting, mentorship, and programmatic support. The Spanx by Sara Blakely Foundation was founded in 2006 to empower women and girls through education, entrepreneurship, and the arts. The Civic Impact Loan Fund, created in December 2016 by Atlanta Emerging Markets, Inc. in partnership with the Center for Civic Innovation, is an innovative investment tool that provides flexible, zero-interest loans to entrepreneurs who have early-stage businesses that are making a difference in their local communities. Malika Whitley | ChopArt works to extend dignity, community, and opportunity to youth experiencing homelessness through multidisciplinary arts immersion and mentorship. This investment will allow ChopArt to formalize its service offerings and increase their internal capacity, which will allow them to expand their client base to shelters across the region and country. Beth Malone | Dashboard US specializes in artist-led projects that use human-centered design to re-imagine the way we all experience our environments, improve livability, and preserve culture in our communities. Dashboard works in neighborhoods and communities with high amounts of distressed property and their projects bring these buildings and spaces to life. The organization aims to create 100 new part-time jobs for community members and 10 permanent jobs every year over the next three years. Rutu Chaudhari | The Dharma Project provides mindfulness and yoga classes to those working in professions that face high levels of trauma and stress, such as police officers, first responders, and teachers. The loan will allow them to increase revenue and expand services into more schools, police precincts, and communities in Atlanta. Susanna Spiccia | re :imagine /ATL works to empower the next generation of storytellers through film and digital media production by training students and connecting them directly to professionals in the industry. The business plans to use the funding to grow and scale their programs to reach more students and expand into new cities across the United States. Now in its second year of operation, the Civic Impact Loan Fund has provided funding to a diverse group of early-stage businesses in a diverse set of impact areas, including community development, the arts, wellness, and education. Last year, Civic Impact Loan Fund loans were awarded to 2016 Civic Innovation Fellows honorCode and Marddy’s and 2017 Food Innovation Fellow (in partnership with Food Well Alliance) Gilliam’s Community Garden. The success of the first class in creating strong community impact demonstrated proof of concept for the fund. AEMI is a certified Community Development Entity (CDE) that seeks to foster economic development, job creation, and neighborhood revitalization in Atlanta’s distressed neighborhoods. An affiliate of Invest Atlanta (the City of Atlanta’s economic development agency) AEMI was created in 2006 to utilize federal New Markets Tax Credits (NMTC) to attract private capital to the City. Since its inception in 2006, the Spanx by Sara Blakely Foundation has donated millions to charities around the world, focusing on charities that empower underserved women and girls. In 2013, Sara Blakely became the first self-made, female billionaire to sign the Melinda and Bill Gates’ and Warren Buffett’s Giving Pledge, promising to give at least half her wealth to charity. While many of the world’s resources are being depleted, one is waiting to be unleashed: Women. The Spanx by Sara Blakely Foundation is on a mission to support women and help them SOAR through education, entrepreneurship and the arts. The Center for Civic Innovation invests in outcome-driven and community-led ideas that create systems-level change. Launched in 2014, the focus of the Center for Civic Innovation remains to lead community-wide conversations on issues of inequality, to invest in entrepreneurial ideas in the social sector, and to strengthen civic engagement so people’s voices and ideas remain at the center of public decision-making. Over the past 2.5 years, they’ve invested over $1.5M of new capital into 69 entrepreneurial, community-led ideas. 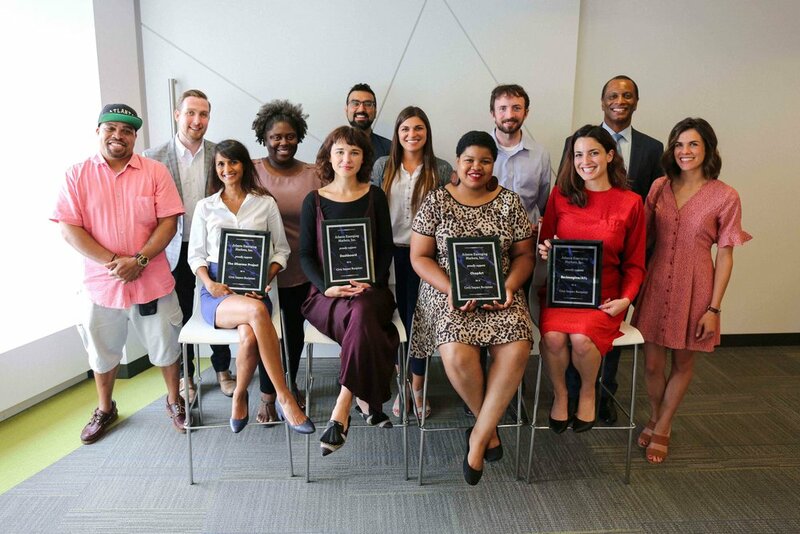 Many of them got started in our Civic Innovation Fellowship – a six-month leadership and entrepreneurship program focused on the development and growth of ideas that create social impact in Atlanta. Applications are open now - August 31st.